Ruthiebear (Titusville, NJ, United States) on 14 October 2012 in Landscape & Rural and Portfolio. The lighthouse is located on a very rocky coast. The flat shape of the rock is very interesting! You can see why they need a lighthouse up there. Breathtakingly gorgeous scenery and the color is so beautiful and bright look that I have not seen in a long time!:-))Haleja. Love the shot, but, if it had been me, I would have cropped the top 1/4 inch to get rid of the jaunty horizon, what d'ya think? In a place like that a lighthouse is really needed. Joli dialogue entre liquide et solide! Entre le tranchant de la roche et le bleu de la mer! quel cadrage la large place au bleu en bruissement et ces rochers avec du blanc sueprbe. Wunderbar diese Blautöne. Ich würde auch von oben noch etwas Schneiden. I think Chris made a good suggestion re: that errant bit of sky. I love that bright blue sea! Nice composition...except for the small part of sky in the upper right corner, maybe? 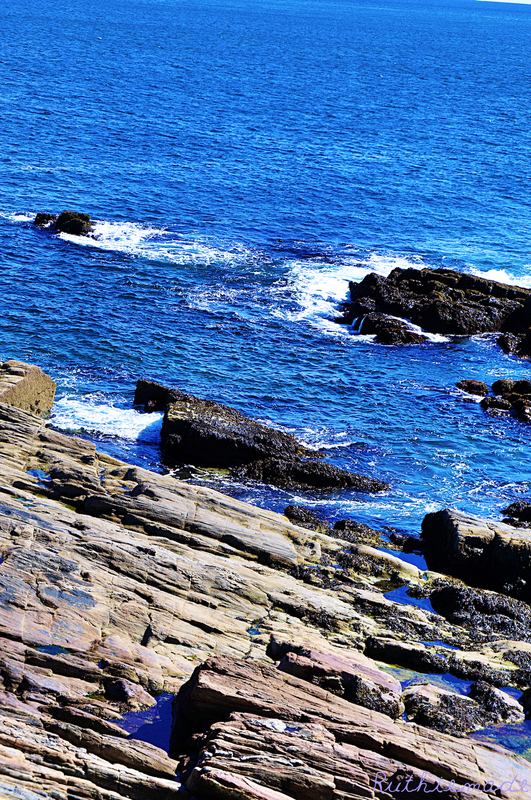 But I like the contrasts between the sea and the rocks. A great shot. this is very pretty this blue sea and all these rocks. A beautiful composition and excellent photo. A fine shot with such vivid blues in the water. It's interesting to see the terrain of the lighthouse site. Un cadrage et des teintes magnifiques ! Incredibly bright blue water. Is this natural color? Or did you over saturate? Such a rugged coastline. I like the little pools in the rocks. Beautiful color. Nice detail of the rocks. Great texture and wonderful colours! The diagonal lines are excellent. I just would cut the little piece of white in the right upper corner ... perfect! A pretty shot of the rocks and sea.